A native of Atlanta, Walter M. Kimbrough was his high school salutatorian and student body president in 1985, and went on to earn degrees from the University of Georgia, Miami University in Ohio, and a doctorate in higher education from Georgia State University. He has enjoyed a fulfilling career in student affairs, serving at Emory University, Georgia State University, Old Dominion University, and finally Albany State University in 2000 where he became the Vice President for Student Affairs at the age of 32. In October of 2004, at the age of 37, he was named the 12th president of Philander Smith College. In 2012 he became the 7th president of Dillard University in New Orleans, Louisiana. Kimbrough has been recognized for his research and writings on Historically Black College and Universities, more commonly referred to as HBCUs, and African American men in college. Kimbrough also has been noted for his active use of social media to engage students in articles by "The Chronicle of Higher Education," "CASE Currents," and "Arkansas Life." 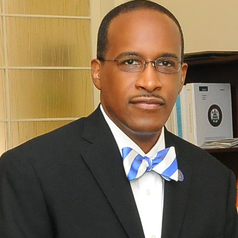 He was cited in 2010 by Bachelors Degree.com as one of 25 college presidents you should follow on Twitter (@HipHopPrez). A 1986 initiate of the Zeta Pi chapter of Alpha Phi Alpha Fraternity at the University of Georgia, Kimbrough was the Alpha Phi Alpha College Brother of the Year for the Southern Region and served as the Southern Region Assistant Vice President. Kimbrough has forged a national reputation as an expert on fraternities and sororities, with specific expertise regarding historically Black, Latin and Asian groups. He is the author of the book, "Black Greek 101: The Culture, Customs and Challenges of Black Fraternities and Sororities." Kimbrough was named the 1994 New Professional of the Year for the Association of Fraternity Advisors, and selected as a 2001 Nissan-ETS HBCU Fellow. In 2009, he was named by "Diverse Issues in Higher Education" as one of 25 To Watch. In 2010, he made the coveted "Ebony Magazine Power 100" list of the doers and influencers in the African American community, joining the likes of President and Mrs. Obama, Jay-Z, Richard Parsons, Tyler Perry, Debra Lee, and Tom Joyner. Finally, in February of 2013 he was named to "NBC News/The Griot.com"’s 100 African Americans making history today, joining another impressive group including Kerry Washington, Ambassador Susan Rice, Kendrick Lamar, Mellody Hobson, and RG III. Kimbrough and his wife Adria Nobles Kimbrough, an attorney with the Kullman firm in New Orleans, are the proud parents of two children: Lydia Nicole and Benjamin Barack.